To see all archived books featured on P & S Book Chat since 2002, visit http://lincolnlibraries.org/bookguide/kfor/. Here is a list of the books discussed in the most recent show: January 12, 2017. Appearing with Cathy on this episode: Scott C., Becky W.C., Lisa V. and show producer Lizz B. Comedy legend Carol Burnett tells the hilarious behind-the-scenes story of her iconic weekly variety series, The Carol Burnett Show . In In Such Good Company , Carol Burnett pulls back the curtain on the twenty-five-time Emmy-Award winning show that made television history, and she reminisces about the outrageously funny and tender moments that made working on the series as much fun as watching it. “Bright Lights: Starring Carrie Fisher and Debbie Reynolds” premieres on HBO in January 2017. When Carrie Fisher recently discovered the journals she kept during the filming of the first Star Wars movie, she was astonished to see what they had preserved–plaintive love poems, unbridled musings with youthful naivet#65533;, and a vulnerability that she barely recognized. Today, her fame as an author, actress, and pop-culture icon is indisputable, but in 1977, Carrie Fisher was just a teenager with an all-consuming crush on her costar, Harrison Ford. With these excerpts from her handwritten notebooks, The Princess Diarist is Fisher’s intimate and revealing recollection of what happened on one of the most famous film sets of all time–and what developed behind the scenes. Fisher also ponders the joys and insanity of celebrity, and the absurdity of a life spawned by Hollywood royalty, only to be surpassed by her own outer-space royalty. 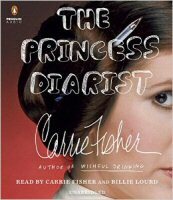 Laugh-out-loud hilarious and endlessly quotable, The Princess Diarist brims with the candor and introspection of a diary while offering shrewd insight into the type of stardom that few will ever experience. Be careful what you wish for. Traveling abroad with her mother at the turn of the twentieth century to seek a titled husband, beautiful, vivacious Cora Cash, whose family mansion in Newport dwarfs the Vanderbilts’, suddenly finds herself Duchess of Wareham, married to Ivo, the most eligible bachelor in England. Nothing is quite as it seems, however: Ivo is withdrawn and secretive, and the English social scene is full of traps and betrayals. Money, Cora soon learns, cannot buy everything, asshe must decide what is truly worth the price in her life and her marriage. Since the days of conquistador Hern_n Cort_s, rumors have circulated about a lost city of immense wealth hidden somewhere in the Honduran interior, called the White City or the Lost City of the Monkey God. Indigenous tribes speak of ancestors who fled there to escape the Spanish invaders, and they warn that anyone who enters this sacred city will fall ill and die. In 1940, swashbuckling journalist Theodore Morde returned from the rainforest with hundreds of artifacts and an electrifying story of having found the Lost City of the Monkey God-but then committed suicide without revealing its location. Though Anita has kept herself at a distance from her classmates, Lottie’s sphere of influence is inescapable, her energy irresistible, and the two become fast friends. Pulled into her elite world, Anita learns what it’s like to be treated as a wealthy, educated white woman–the person everyone believes her to be–and even finds herself in a heady romance with a moneyed Harvard student. It’s only when Lottie becomes infatuated with Anita’s brother, Frederick, whose skin is almost as light as his sister’s, that the situation becomes particularly perilous. And as Anita’s college graduation looms, those closest to her will be the ones to dangerously threaten her secret. Set against the vibrant backdrop of the Gilded Age, an era when old money traditions collided with modern ideas, Tanabe has written an unputdownable and emotionally compelling story of hope, sacrifice, and betrayal–and a gripping account of how one woman dared to risk everything for the chance at a better life.